K: You should draw a smiley face on that big log in the middle of your woodpile. Me: You think? I don’t know. Last year I put numbers on some of the wood, to help estimate how long it would last. People made fun of me. K: You put numbers on your wood? Are you a Virgo? K: I knew you were a Virgo as soon as I saw your wood pile. Me: What?! Come on. That is a totally substandard wood pile. That is not at all up to Virgo standards. I mean, the whole tower on the right side is leaning over. K: See? That’s the sort of comment that shows you’re a Virgo. This entry was posted on November 28, 2011 at 11:14 pm and is filed under Amusing tales. You can follow any responses to this entry through the RSS 2.0 feed. You can leave a response, or trackback from your own site. Oh wow, my mother (also a virgo) makes so much more sense now. 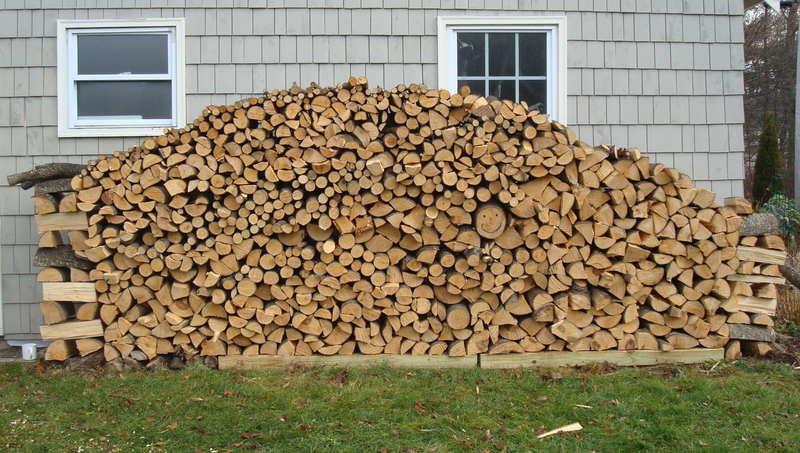 For what it’s worth, I don’t think the woodpile looks substandard at all. Rather, quite impressive. Kelly Palomera? She cut our spruces and a huge hemlock for us. Jess is using most of it for lumber, not heat, though. Is that wood pile on the south side of the house to get sun, or the north side to block the wind? Ha! It’s on the south side, for sun– but it’s only blocking sun from the garage, so no loss of solar gain to the living quarters!